Effective January 1, 2018, WCRE proudly announced the promotion of Chris Henderson to Principal and Shareholder of the firm. Chris joined the firm in 2014 and was previously promoted to vice president in 2016. Chris has been recognized for his tremendous leadership skills, collaborative approach, entrepreneurial spirit, and a boundless work ethic that has served him well within the company and the community. 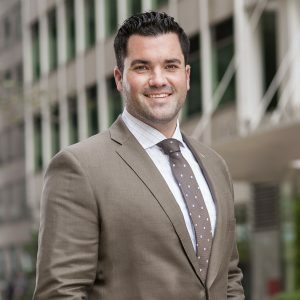 When Chris joined Wolf Commercial Real Estate in 2014 as an associate, he brought a unique aptitude and skill set to the team. The leadership skills, collaborative approach, entrepreneurship, and boundless work ethic that served Chris well during his previous careers in professional baseball, business marketing and client service have proven to be highly effective to his young commercial real estate profession. Chris focuses on all facets of Commercial Real Estate in the Southern New Jersey and the Philadelphia Region. Distinguished by his uncanny ability to find, source and cultivate opportunities for his clients, Chris has gained notoriety as one of the offices most prolific business generators and has redefined success for young professionals entering the business. Chris is routinely at the helm of WCRE’s high profile assignments. Chris served successfully at Woodcrest Country Club in a variety of client services roles, including leading event sales and hospitality management. He also contributed to marketing, social media, and other relationship-building efforts. Chris played professional baseball with the Los Angeles Dodgers organization for five seasons. He was drafted during his junior year of college, and admirably completed his degree in marketing while competing at the highest level of professional sports. Chris was an outstanding student athlete at George Mason University, becoming the first player in school history to be named First Team All-American, and leading his baseball team to only its third ever NCAA regional appearance. During his baseball career Chris also devoted time and energy to training and educating younger athletes as owner and operator of the Prospect Baseball Academy. In this role he trained more than 200 baseball players and gained valuable experience in founding and managing a successful business. As a young professional Chris has been honing his marketing and management capabilities, and developing a wide network of business relationships. At WCRE Chris will maintain a strong client focus by serving client needs and developing productive relationships with client representatives.